There are 19 Assisted Living Facilities in the Quarryville area, with 2 in Quarryville and 17 nearby. To help you with your search, browse the 47 reviews below for assisted living facilities in Quarryville. On average, consumers rate assisted living in Quarryville 4.8 out of 5 stars. Better rated regions include Street with an average rating of 4.8 out of 5 stars. Caring.com has helped thousands of families find high-quality senior care. To speak with one of our Family Advisors about assisted living options and costs in Quarryville, call (855) 863-8283. Quarryville is a Lancaster County borough just west of Philadelphia. Named for the many quarries in the area, Quarryville has easy access to city amenities. Quarryville seniors who need assisted living care can choose from two ALRs in town and 44 others in the surrounding areas. Seniors here will find a retirement-friendly atmosphere established by the Quarryville Presbyterian Retirement Community. 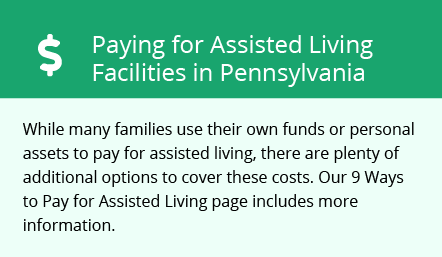 Pennsylvania assisted living facilities are referred to as assisted living residences (ALRs) and receive licensing from the state's Department of Aging, Office of Long-Term Living, Division of Licensing. The cost of living in Quarryville is 7 percent higher than the national average, with the most significant contributing factors being health care and transportation. While seniors pay slightly more for necessities, most costs remain fairly close to the national average. The Quarryville area has no facilities from which to choose in the event of a medical emergency or illness, with the nearest major hospital located in Lancaster. Seniors looking for warmer and drier climates might be unhappy with Quarryville's 68 inches of precipitation each year, July highs of 84 degrees and January lows of 22 degrees. There are no public transit options in Quarryville, so seniors in need of transportation rely on out-of-town taxi services or on-demand ride share apps such as Lyft or Uber. Seniors concerned about personal safety should note that Quarryville has a crime index of 15, meaning the chance of being affected by criminal activity in the area is 1 in 33. Violent and property crimes are both concerns for Quarryville residents, with higher than average rates for both, so seniors are encouraged to take precautions. Seniors who have conditions that make them sensitive to air quality may have issues in Quarryville. Lancaster County has been given an D grade for average number of high-ozone days annually by the American Lung Association report of 2018. The county also had a failing grade for high-particle pollution days. Assisted Living costs in Quarryville start around $0 per month on average, while the nationwide average cost of assisted living is $4,000 per month, according to the latest figures from Genworth’s Cost of Care Survey. It’s important to note that assisted living rates in Quarryville and the surrounding suburbs can vary widely based on factors such as location, the level of care needed, apartment size and the types of amenities offered at each community. Quarryville seniors may be eligible for financial assistance through the Pennsylvania Medicaid program. The state's Department of Aging (PDA) waiver is being replaced by the Community Health Choices (CHC) program, which covers additional services. Services My Way is another program that gives seniors the opportunity to self-direct their care. Quarryville and the surrounding area are home to numerous government agencies and non-profit organizations offering help for seniors searching for or currently residing in an assisted living community. These organizations can also provide assistance in a number of other eldercare services such as geriatric care management, elder law advice, estate planning, finding home care and health and wellness programs. To see a list of free assisted living resources in Quarryville, please visit our Assisted Living in Pennsylvania page. Quarryville-area assisted living communities must adhere to the comprehensive set of state laws and regulations that all assisted living communities in Pennsylvania are required to follow. Visit our Assisted Living in Pennsylvania page for more information about these laws.